If you want to check out the ones we've already done, Selfie, Red Band Society, and Madam Secretary can be found here and A to Z, Scorpion, and Gotham can be found here. Now, Forever, NCIS: New Orleans, and Black-ish! The premise and arc defining mystery both are interesting enough, the cast is good, but the show just doesn't work. Ioan Gruffudd plays Henry who is over 200 years old, because he can't die. Every time he dies, he wakes up naked in a nearby body of water. I'm not sure what happens to his body when this occurs, since the episode doesn't deal with that possible inconsistency. Ignoring that, there are still some huge plot holes, plot holes you could drive a subway train through (that's how we first see Henry die in the pilot, as a subway train drives through the back of a stationary subway train). Consider this, Henry died in the crash that is being investigated, which, remember, means he shows up in a nearby body of water, naked, which resulted in him being arrested and spending the night in jail for indecent exposure. Therefore, there is proof of Henry being arrested shortly after the crash far from the site of the crash. Yet despite this obvious alibi, the detective spends a fair amount of the episode convinced that Henry somehow was responsible. And then when she begins to admit maybe he is innocent, he completely is invited along on the investigation. As a medical examiner. Why is a ME going anywhere besides the morgue on an investigation? It would be nice if the show at least tried to offer an explanation. The show made a big deal about Henry's investigative abilities, they might as well have made him a detective. There are a couple of good twists at the end of the episode, but the story still was mostly predictable and obviously procedural driven, which is not a big draw for me. Sure it offers a couple big arc-type mysteries that presumably will occur each week inside of the week to week mysteries, but it still felt entirely like a weekly procedural and didn't do enough to make me overlook that fact. Interesting Fact: Ioan Gruffudd was Horatio Hornblower in the series of films based on that iconic character and also one of the best parts of the unfortunate Fox produced Fantastic Four films. When the next Fantastic Four movie bombs, I'm hoping Fox will allow the property to lapse back into Marvel control and when Marvel gives us the first great Fantastic Four film, here's hoping Ioan Gruffudd is back as Reed. In case you couldn't tell in the last review, I'm not a big procedural fan, and this is all procedural all the time. You could pick up any episode of this show and not be lost, because there is little character development or ongoing plot points, it is all mystery of the week. No thanks. That by itself was enough to make me dread having to watch this (so you don't have to! ), but it was worse than I could have imagined. I was hoping at least the greatness of Scott Bakula (Quantum Leap and Enterprise) would help mitigate the pain, but his poor attempt at a New Orleans/Cajun accent was grating. Then there was the odd effect of starting each act with a freeze frame of where the act would end. I'm not sure what that was about, but it was extremely annoying. The episode story itself required a huge coincidence to drive the story and the way it was told highlighted that coincidence even more. The back and forth bickering between the secondary characters (assuming Bakula is the main character) was incredibly forced and had me continually rolling my eyes. There's a reason I don't like these types of shows, and this one did nothing to change that. Interesting fact: In my head, Scott Bakula's character is actually Sam from Quantum Leap and each case could be his chance to finally leap out of this body. Watching with this idea gave me a little more incentive to make to the end of the episode, but the lack of Al and no jump to a new body at the end of the episode brought me back to reality. Okay, I didn't care enough to find you an interesting fact on this show. Sorry. As I've mentioned many times before, sitcoms have the hardest time finding their groove. It wasn't until well into season 2 that The Office really worked. Parks and Rec is one of the best comedies of all time, but its first season isn't that good either. Black-ish actually has a stronger first episode than many sitcoms have had, but you can tell it hasn't quite got everything down yet. The episode had many laugh-out-loud moments, and the characters are strong, but the pacing of the episode was off. The show had a fun, funny, and quite relevant storyline for the first episode, but it spent nearly the entire episode building that storyline up. The ending was ridiculously rushed, which completely took me out of the story. I was shocked at how fast everything was wrapped up, and a few of the moments that were part of the build-up were completely dropped at the conclusion. That was a little frustrating. However, I've learned not to judge sitcoms too harshly on their pilots. After I watched the first episode of The Big Bang Theory, I was never going to watch it again, but now I'm glad I've stuck with it. I see way more potential in this pilot than I did in The Big Bang Theory. While I had some problems, primarily with pacing, with this episode, the show is definitely one I plan on giving a chance to find its rhythm. Interesting Fact: The Great Lawrence Fishburne (who plays Pops, the father of Anthony Anderson's main character) had his first acting role in Apocalypse Now when he was only 14 years old (though he celebrated his 15th and 16th birthdays while filming). Before his arguably biggest role as Morpheus in the Matrix films, he was probably best known for his role in John Singleton's Boyz N the Hood. Oddly enough, Fishburne and Singleton met while they were both working on Pee Wee's Playhouse, Fishburne as Cowboy Curtis and Singleton as a PA.
Until Next Time, At the very least, reviews of The Mysteries of Laura and How to Get Away With Murder should be coming very soon! 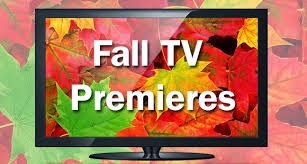 Enjoy your fall TV! If your hope for Fantastic Four is true, I want there to be a strange exchange between Captain America and Reed along the lines of "Don't I know you?"